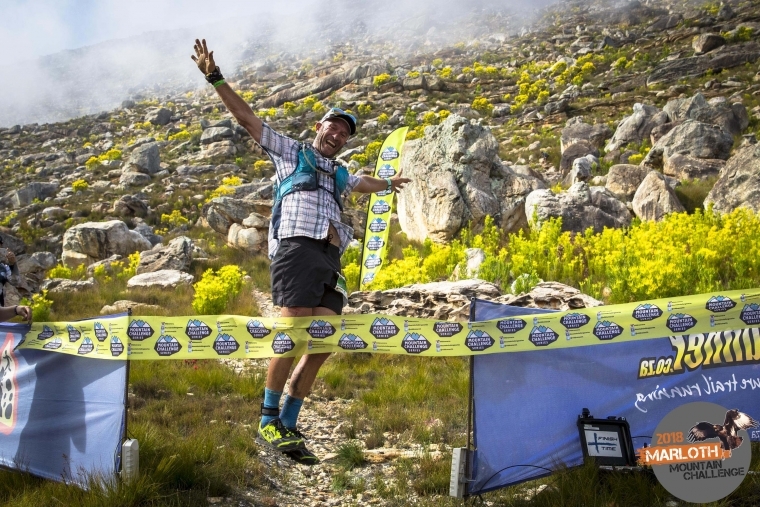 Sunday 7 October saw the culmination of intense preparation and training roll out in to a two-day mountain festival in the beautiful, sleepy town of Swellendam. 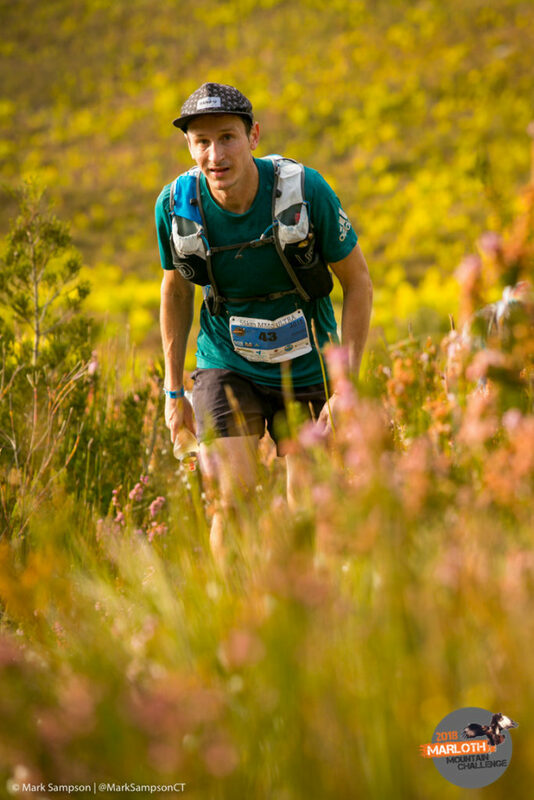 Sunday 7 October saw the culmination of intense preparation and training roll out in to a two-day mountain festival in the beautiful, sleepy town of Swellendam. Runners joined the crew from 12 noon on Saturday, going through kit check and registration, and grabbing a last cold lager with friends as final race prep was discussed. A sea of nervous energy took in the Saturday night race briefing in the race village, and a delicious dinner was enjoyed at the quaint old Drostdy Museum in the centre of town, as Sunday loomed large. Roger Dickson, a Cape based veteran runner, led the early 24.5km charge in what was later described as “a Park Run race pace”. After the first few km, a lead pack of Dickson, fellow vet Pete Calitz, and youngster Stephen Millard formed. They were closely followed by first woman Hayley Preen. Hayley almost always runs a carefully calculated race. She planned one of her finest attacks, moving through the field in the second half to pass all the men but Calitz. Pete flew down to break the tape in a style that has become expected of the man; all smiles, and in a blur of colour. Pete was followed by Roger Dickson and Stephen Millard rounded out the men’s podium. 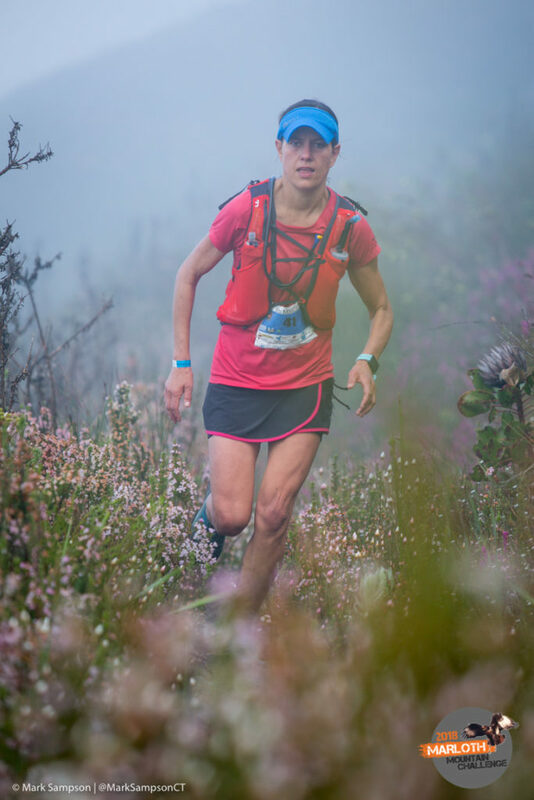 Kristen Heath was second woman over the line, and Anneke du Plessis was third. In the 35km race, word from the course was that Jonathan Black and Lucas Adams had taken an early lead at eye-bleeding pace. Both Jono and Lucas are light-footed downhill dancers, so the 1 675m of ascent and 2 243m of descent was well suited to their individual styles of racing. With the mist lifting and the heat starting to rise rapidly, it was clear that there would be carnage on the course, and a lot of fresh, mountain water pool dipping for those who had the time. 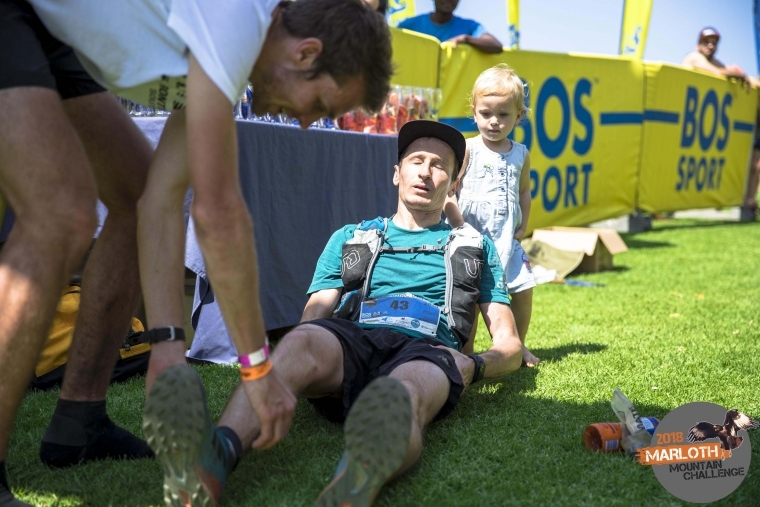 By halfway, Jono had about a 1 minute lead on trail mate Lucas, and supporters on the finish line began some careful calculations as Wesley Sweetnam’s 4:09:31 record seemed set to fall. At the 20km mark, Black refuelled swiftly, taking in plenty of ice cold fluid for the last, hot 15km where two sketchy climbs could have derailed his race. In the end, he went a solid 23 minutes below the course record. Adams too finished under the record, just 12 minutes behind Black, setting the bar high for next year’s middle distance speedsters. Grobler Basson came in third. In the women’s race, Nina-Mari Bruwer lead from early on, taking the win in some 10 minutes ahead of Emily Yeo. Manal Stulgaitis rounded out the women’s podium in the 35km. The 55km Ultra has never been particularly kind to its participants, but no one lines up for this one expecting anything less. 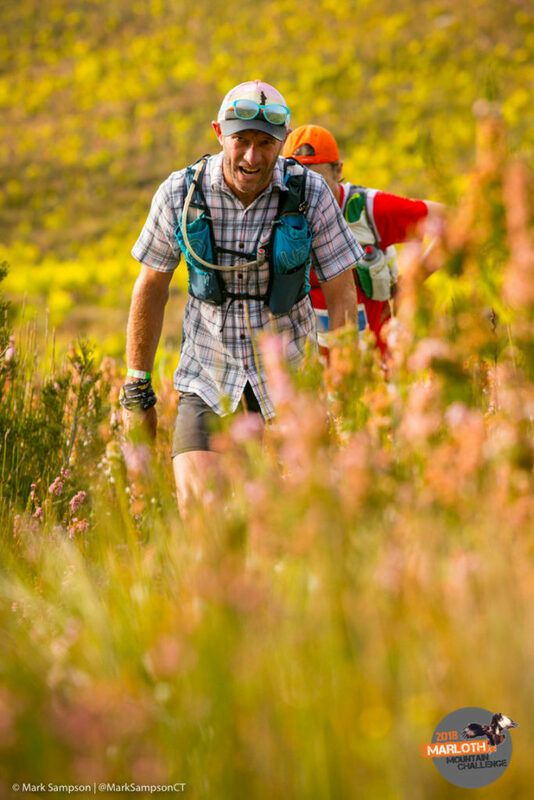 With 3 550m of ascent and descent over relentlessly technical, unbelievably beautiful, brutal terrain, the 12 hour cut off doesn’t leave much time for the back-enders to stop and smell the prolific fynbos or enjoy the panoramic views. Andrew Hagen led the first charge, followed by David Long, Dale Symons and Andre-Hugo van Zyl. Marna van Deventer held an early lead, with Camille Oliante and Caitlin Lewis not far behind. David Long had taken the lead by the 40km mark, creating quite a gap on Hagen. In the end, an exhausted David Long cross the finish line in to the arms of his toddler daughter in a time of 7:29:44, reaching his sub 7:30 goal with just seconds to spare. A fine victory for a true gent who has had a great year of running so far. Hagen followed in second position, in a time of 8:00:50, with his battered legs seizing up completely on the finish grass. Ian Metcalfe finished 6 minutes later. Marna van Deventer ran a strong race, coming in to a growing crowd and vibey festivities in 9:20:01, followed by Caitlin Lewis in 9:48:50. Caitlin, back from the US temporarily, was also the first master over the line. Camille Oliante finished third in 10:48:54.